Visual Studio setup an deployment projects require the target “bitness” of target Windows operating system to be set. This means that I have to create two installation files, one for 32bit and one for 64bit Windows for my Visio add-ins, for example. All this information is available elsewhere, but it is not readily available when answering support questions. When run, it will simply display the bitness of your Windows and your current versions of Microsoft Office, Microsoft Visio Viewer and Microsoft Visio. 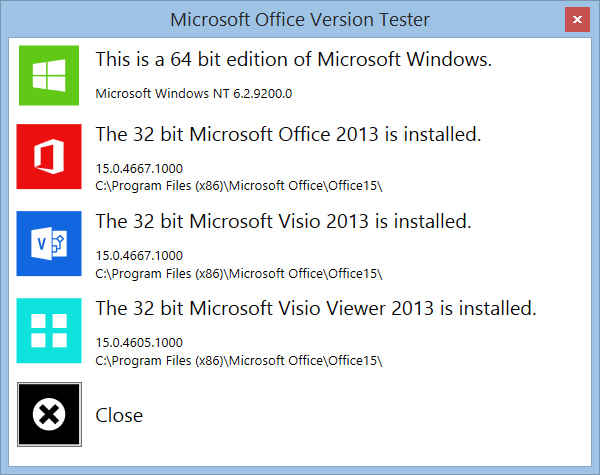 Nothing is permanently installed, and Microsoft currently recommend that the 32bit editions of Office and Visio are installed, unless you are using extremely large spreadsheets or drawing files.